As a physician, it is a very gratifying experience seeing my patients return to their daily lives after treatment. Dr. Sanders specializes in acute trauma and posttraumatic reconstruction, as well as Foot and Ankle Surgery. He is the President of Florida Orthopaedic Institute, a group he helped found, and the Director of the Orthopaedic Trauma Service. He is currently the Chairman of USF’s Department of Orthopedic Surgery. 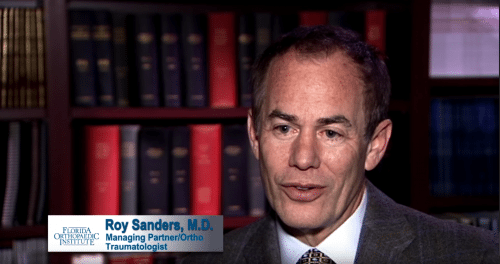 Dr. Sanders attended medical school at the New York University School of Medicine in New York City, and performed his residency at the Hospital for Joint Diseases Orthopaedic Institute, also in New York City, graduating in 1985. Dr. Sanders received fellowship training in musculoskeletal trauma at Vanderbilt University Medical School, and then went on to obtain the AO/ASIF Jack McDaniels Memorial Trauma Fellowship, which he completed under the tutelage of Thomas Ruedi, M.D., in Chur, Switzerland. Upon his return, he spent several months with Sigvard T. Hansen, Jr., M.D., as a foot and ankle fellow at Harborview Medical Center in Seattle, Washington. Dr. Sanders is highly respected both nationally and internationally for his work in orthopaedic trauma, and foot and ankle surgery. He has designed a comprehensive plating system for articular fractures of the upper and lower extremities (A.L.P.S.©, DePuy Orthopaedics), as well as developing a complete intramedullary nailing system for long bones (Trigen©, Smith & Nephew) in conjunction with Dr. Toney Russell, M.D., of Memphis, Tennessee. Dr. Sanders is the Past President of the Orthopaedic Trauma Association (2004-2005) and is currently serving as Director of the Orthopaedic Trauma Service, and the Chief of the Department of Orthopaedics at Tampa General Hospital. He has been involved in resident and fellowship training for over twenty (20) years. He has been a past Chairman of the Committee on Trauma for both the American Academy of Orthopaedic Surgeons, and for the American Orthopaedic Foot and Ankle Society. Dr. Sanders has authored over 100 articles and abstracts on orthopaedic trauma, published several textbooks on orthopaedic trauma, and is presently the Editor-in-Chief of the Journal of Orthopaedic Trauma, the leading international journal in the field. He has served as faculty for over 150 courses, has given over 230 lectures, and served as course Chairman for 39 courses to train other orthopaedic surgeons, including originating the AO/ASIF Course in Foot and Ankle Trauma with Sigvard Hansen, and the Current Solutions in Orthopaedic Trauma Course, now in its 8th year. He has been an investigator in over 20 research studies including a landmark National Institutes of Health investigation on limb salvage, for which he was a recipient of the AAOS prestigious Kappa Delta Ann Doner Vaughan Award for Outstanding Orthopaedic Research in February of 2003. His special area of expertise is reconstructive surgery of the lower extremity (complex fractures, mal/nonunions, deformity correction, post-traumatic arthritis, and bone infections). The best doctor ever. He took great care of me and because of Dr. Sanders, I can walk again perfectly! Dr. Sanders has always been the most courteous and professional physician I have had the pleasure to see. I was returning for my one year check up on an ankle fusion. My pain went from unbearable to minor. I have increased ankle mobility. I’m back to bowling, bicycling and walked 9 holes of golf the past weekend. It’s such a blessing to be active again after years of limited mobility and major pain/discomfort. Dr. Sanders and his staff through the entire process were outstanding. I highly recommend Dr. Sanders and his staff to other ankle sufferers. I went to Florida Orthopaedic Institute almost a year ago for an ongoing ankle issue that I knew needed surgical repair; I was suffering from a flat-foot deformity. Fortunately, I met Dr. Roy Sanders who assessed my ankle issues and agreed to do the surgery. The surgery was delayed a bit due to Hurricane Irma, but in October 2017 I had ankle reconstruction at Tampa General Hospital. Numerous procedures were done during the surgery and I was hospitalized for 3 days. Following Dr. Sanders’ orders meticulously, my cast was off in January 2018, and I graduated to a walking boot. Today, I am moving well and enjoying life. I highly recommend Dr. Sanders and his staff. A special shout out to Nancy, his assistant who was always responsive and extremely helpful. No matter what your orthopedic issue may be, I highly recommend Florida Orthopaedic Institute; if you need your ankle checked out, no one will attend to you as well as Dr. Roy Sanders. I am grateful to the entire staff for their medical expertise and service. Dr. Sanders and his staff were phenomenal. I believe he and the staff are the best I could have imagined having. Very positive, informative and friendly. The absolute BEST! For many years walking became difficult. Each step was agonizing! All the pressure with walking was focused in one spot on each foot in the metatarsal area. After trying custom orthotics for a period of time and numerous shoes, I knew I was headed for the wheelchair full time. I was running out of options. Fortunately, I was referred to Dr. Roy Sanders. Not only is he kind and caring, but he also has a brilliant gift! Dr. Sanders can work outside the box solving difficult foot problems. He listens closely to any concerns. After successful operations on both feet, I can walk again with minimal discomfort. I am so thankful to Dr. Sanders and his Administrative Assistant Nancy for working around my schedule. I live 470 miles away which added another obstacle. The staff at the Florida Orthopaedic Institute are professional, knowledgeable and made me feel at ease. I am forever grateful to Dr. Sanders and his team! After three frustrating years of being in pain and finding no relief, I found you. I am so glad you were the doctor to perform the surgery. You are a kind and gifted man and I appreciate the skill and wisdom you used to help me get back to a life I enjoy. Thank you for all you did and for having a practice that made me feel good just to be there. I wish you continued success. Dr. Sanders is incredible! In April of 2016 I sustained a severe calcaneus fracture when a scaffold broke under me . My ankle (talus) was embedded in my heel, which was in several pieces. My wife and I were told by two orthopaedic doctors that they were not able to perform this degree of surgery. With no health insurance, in great pain, shock, desperate, and frightened, we were directed by all to Dr. Sanders, our only hope in the world to do the surgery. Words can hardly express the immense appreciation, admiration, gratitude, and respect my wife and I have for this man . His dedication, skill, and compassion is very moving. Dr. Sanders put me back together and restored my ability to work, walk, and climb. I had a total ankle reconstruction with a fusion. Dr. Roy Sanders was very thorough in explaining the procedure. He has a very kind and calm demeanor. The total experience was awesome. From Dr. Sanders office to Tampa General Hospital, I received excellent care. Post-op was quite long but totally worth it. I am now pain free and walking comfortably. Kudos to Dr. Sanders and staff. Dr. Roy Sanders the very best orthopaedic surgeon and all around great guy!! In 1996 I had my first total ankle replacement, in 1996 he did the other ankle. Over the years I had many problems with my ankles. Dr Sanders never gave up on me and I never gave up on him. I still have both replacements with modifications. There was nothing left to my left ankle when I first met Dr, Sanders. I was told by other doctors that I needed to have it amputated. I had such confidence in Dr. Sanders from the first, he told me all the risks up front. I am still walking 22 years later, thank you for always being there for me. A big shout out to Nancy, you are a sweetheart. Dr. Sanders is a wonderful surgeon, he continues to do what is needed to help me get better. He never rushes me, he listens to my concerns and tries to help me understand what needs to get done. His administrative assistant, Nancy, is the best!! The whole staff is amazing! I had a total ankle reconstruction with a fusion. Dr. Roy Sanders was very thorough in explaining my procedure. He has a kind and calm demeanor. The entire experience I had was awesome. From Dr. Sander’s office to Tampa General Hospital, I received excellent care. I am now pain free and walking comfortably. Kudos to Dr. Sanders and his staff! Dr. Sanders is the very best doctor in the field. I want him to know the great appreciation, admiration, gratitude, and respect my wife and I both share for him. His dedication, skill, and compassion for others is very moving. We want to thank you him from our hearts. Dr. Sanders is a genius in repairing foot and ankle fractures and injuries. I was hit pretty bad in a car accident, no fault of mine. I had bone non-reunion which he set correctly and I am on my way to having almost complete recovery. I cannot thank him enough and I cannot thank my stars enough that I found him as my doctor! After several years of increased pain from a complex foot and ankle problem I could not find a Dr. who wanted to treat me near our home in The Villages, other than bracing. After much research I found Dr. Roy Sanders. From the first appointment he understood what the problem was and presented me with a plan as to how the pain could be eliviated. It involved a reconstruction of my foot. I’ve unfortunately needed to visit many Dr’s offices over the past few years for other problems. I have never encountered a more efficient and competent operation. From the moment you walk into their office – from reception, X-ray and casting departments to their nursing staff and most importantly Dr’s, you are treated with respect and consideration of your time, a true rarity in today’s medical world. I do not hesitate in recommending Dr. Sanders and The Florida Orthopedic Institute. On August 19, 1998, Dr. Roy Sanders did my ankle replacement, I wanted to let him know that after 18 years I am still going strong. I walk 2-3 miles every day with no pain. I am so glad I found him! On October 30, 1998 I was hit on a motorcycle in NY Long Island. After many operations in NY (I beleive 6), a broken leg in 4 places, pelvis 5 places and ribs the NY doctors wanted to amputate my leg. I was not sure what to do so my sister in FL referred me to Tampa General Hospital where I met Dr. Sanders. Thank god for that! He knew just what to do. The other doctors were operating on me with bone infection. Dr. Sanders sat down and talked to me like a regular guy and told me he could put me back together. There was a trust right off the bat. He saved my leg, he is the best of the best ; the Master! I can never thank him and his staff enough. Still to this day I see him and he is still that regular guy. If you are in trouble don’t walk but run to see him and his staff. Thank You Dr. Sanders, you’re the Best of the BEST!